This marked our tenth year working on the Missouri River. We wanted our work this year to reflect our ten years of growth, the skills we've gained and the great partners who make our projects better. At the same time, we wanted to build a foundation for an effective future. 2011 was also the year of massive flooding on many stretches of the Missouri River. It began a few weeks after our round of spring clean-ups in South Dakota, Iowa and Nebraska in April and May. At the same time our friends upstream were fighting and documenting the effects of the flooding, we redesigned our downstream plan for the fall. Called the Big Muddy Clean Sweep, this would be a series of clean-ups based out of a trash barge chartered from Living Lands & Waters, the organization that helped start Missouri River Relief 10 years ago. 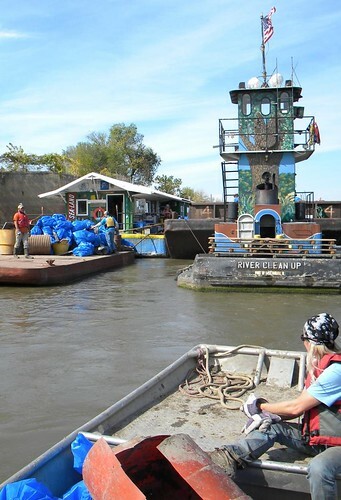 We still decided to have a string of cleanups across the state, but based our cleanups from land as we moved downstream until the trash barge could join us in Jefferson City. Then we moved onto the barge, which became our river home and base of operations. 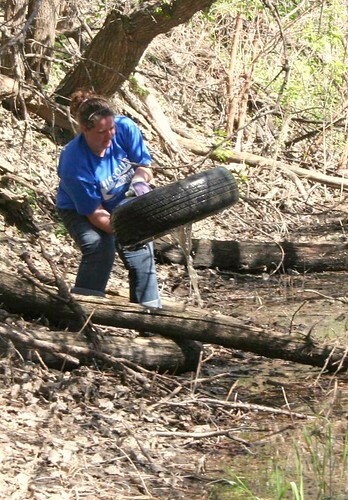 The Big Muddy Clean Sweep was a mix of clean-up work, river education and partnership building. And we filled a barge with trash - a visual snapshot of the garbage strewn along the banks and forests of the Missouri River. We continue to develop our river education program. People along the valley are hungry for learn about and interact with the river. The Big Muddy Speaker Series, a monthly presentation on a variety of Missouri River topics, expanded to include locations in Kansas City and Rocheport. We integrated river cleanups into the service learning and art curriculums of schools in several communities, and the results are amazing. This all happens because of the engaged partnership of river professionals, teachers, administrators and parents. 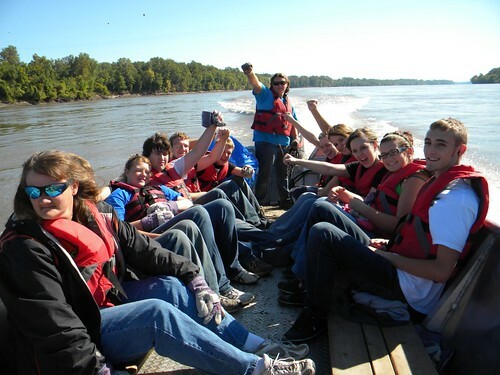 Photo: Students from Owensville High School clean up the river near Hermann, MO. Our thanks to the long list of sponsors, partners and volunteers that made it possible. Especially the Missouri River Relief crew - no one can do what you do! 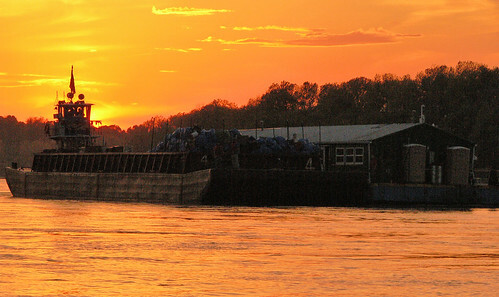 The River Cleanup trash barge approaches our final mooring near the Confluence of the Missouri & Mississippi Rivers.